When your family is ready for a getaway, head to Radisson Suites Hotel Anaheim - Buena Park, located less than a mile from Knott’s Berry Farm and even closer to Medieval Times Dinner & Tournament and Pirate's Dinner Adventure. Get your tickets to Disneyland® Resort, only seven miles away, and then hop on our complimentary shuttle that takes you directly to the park. During your stay in Buena Park, dine at the innovative Flora Restaurant. Our chefs have created an eclectic menu that showcases the vibrant flavors of Southern California. For your convenience, we offer on-site dining every day for breakfast, lunch and dinner. If you want to try some local eateries, stop by the hotel’s tour desk to get recommendations for a variety of cuisines, from burgers to sushi. Knott's Berry Farm – Located less than one mile from the hotel, Knott’s Berry Farm features thrilling roller coasters, live entertainment and wild water rides. You won’t want to miss riding the 4-D interactive Voyage to the Iron Reef. Disneyland® Resort – Spend the day with all your favorite Disney® characters at this popular amusement park with themed adventure rides, live performances, restaurants and more. Don’t forget to visit the shops in the Downtown Disney® District, just outside the park. Angel Stadium of Anaheim – Get tickets to watch the Los Angeles Angels baseball team play at “the Big A.” This stadium is the fourth oldest in the country and has been featured in several movies, including Angels in the Outfield (1994). 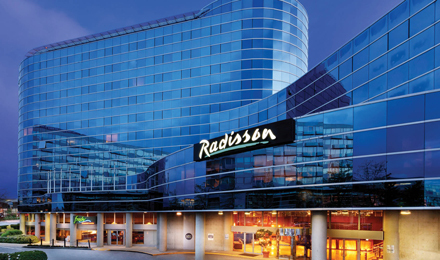 Radisson Suites Hotel Anaheim - Buena Park offers more than 3,600 square feet of elegant event space that is ideal for business meetings and social events of up to 400 people. Our expert staff is happy to work closely with you on every detail, from decorations to customized catering menus. Traveling with your team? The Sports Approved Program gives coaches and athletes a special welcome reception and access to a meeting space for game planning. Stretch out in your spacious suite in Buena ParkAt Radisson Suites Hotel Anaheim - Buena Park, you can rest easy in one of 200 stylish suites that each offer 500 square feet of comfort. The in-room coffeemaker ensures you have a fresh cup of coffee to jump-start your day, and two flat-screen TVs give everyone a chance to watch a favorite show. Ideal for families and groups, our suites are divided into a bedroom with either one king bed or two double beds, a living space and a private bathroom. Whether you want a romantic getaway weekend or have an important meeting to attend, these suites help you feel right at home. Standard amenities include free Wi-Fi, a microwave and a refrigerator. Traveling with kids? Book this suite to enjoy two double beds and all standard amenities, including a sleeper sofa and two TVs that let you watch the news while kids watch cartoons. Enjoy casual Southern Californian cuisine at Flora RestaurantAt Radisson Suites Hotel Anaheim - Buena Park, you're always close to a tasty meal on site at Flora Restaurant. From light bites to hearty meals, you can find great options in the restaurant’s interior courtyard. Flora serves Southern Californian cuisine in a casual atmosphere with friendly, personal service. Breakfast buffet served daily, 6:30-10 a.m.
À la carte items served daily, 6:30 a.m.-10 p.m.